The PolarQuest2018 team arrived in Ny Alesund today, 5 August at 16.00. 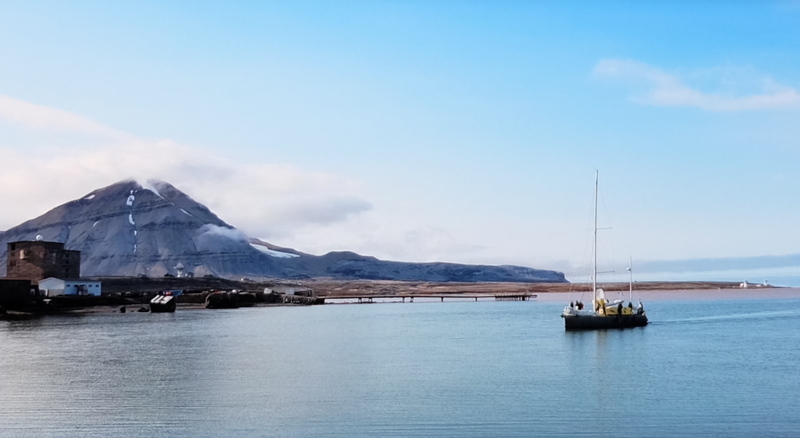 Their trip from Longyearbyen was extremely smooth, allowing Scientific Coordinator Frédéric Gillet and Safiria Buono to use the Mantanet to collect microplastic samples. Tomorrow, 6 August, Frédéric will head into the fjords outside Ny Alesund to deposit PCB sensors in the ice. These will measure chemical pollutants in the Arctic for two years, before been collected in 2020. The team arrived at Ny Alesund just in time for an emotional ceremony with the descendants of Airship ITALIA in front of the Eight Cross Monument. The family laid a wreath of red roses at the Monument, which commemorates lives lost to polar exploration.